I now have a vine trailing up that wall, and it is jumping on trivets that have been placed on the wall by the artist, Juan. I had seen Juan’s “installation” of trivets on a wall at a shop on the Upper West Side of New York some years ago and had long admired their placement. This year Juan has been working with me in my urban garden because, in addition to being an artist, he is a gardener extraordinaire. 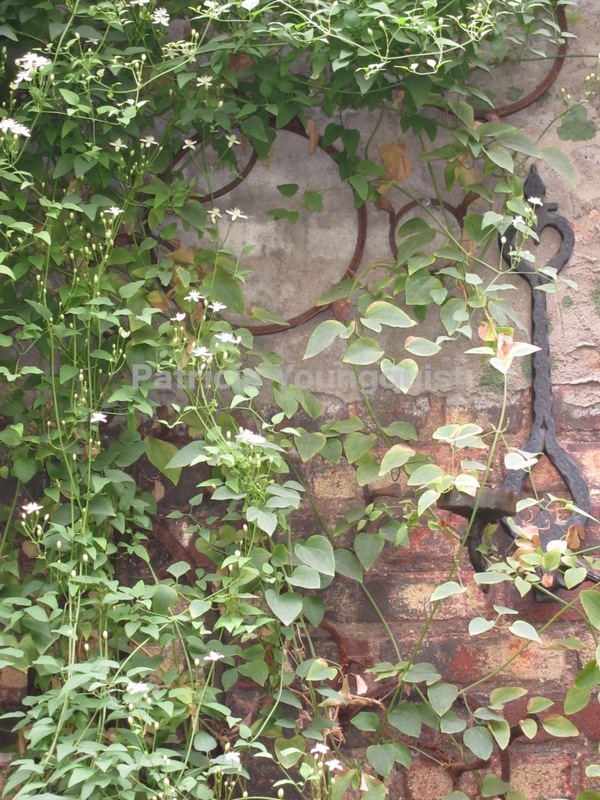 Since I had so many trivets from years gone by, I asked him to do an “installation” on my brick wall so that my Clematis paniculata (Sweet Autumn Clematis) would have a place to play. The Clematis is loving it! This vine is somewhat of a newcomer (one year old) to my outdoor space. This vine had been suggested to me by Jay, another talented gardener, when he was in New York City last May. I got this plant from Donna, a talented grower from Cheerful Cherry Farms who, with her grower–husband, Jim, had a booth at “USQ” — the Union Square Greenmarket. The morning that I bought this plant, I had arrived at the market at about 7:30 A.M., and they were just setting up their booth for the day. Because the print on the plant tag was small, I had to press my face against it to read it in order to make sure that I was getting the Clematis paniculata. Donna looked over at me and, with a cigarette dangling from her mouth, remarked that I must need new glasses. Although it was extremely hot that morning she had on a winter coat and wool hat; her long gray pony tail hung out of her hat and trailed more than halfway down her back. Donna assured me if I planted this plant in a deep container it would trail wherever I trained it to go by the fall. It did not bloom that fall, but the foliage was lovely and did trail up a small trellis that was behind its box–planter. From the trellis, it began to attach itself to a nail on my wall. To protect that foliage on the wall last winter, I tied the vine up and attached to another nail on the wall and dreamed of it trailing against my wall. When Juan came to my garden one day this April, he lovingly untied the vine. I knew both my vine and collection of trivets were made for each other. Immediately they fell in love as evidenced by the photo at the top of this post and the one posted below.